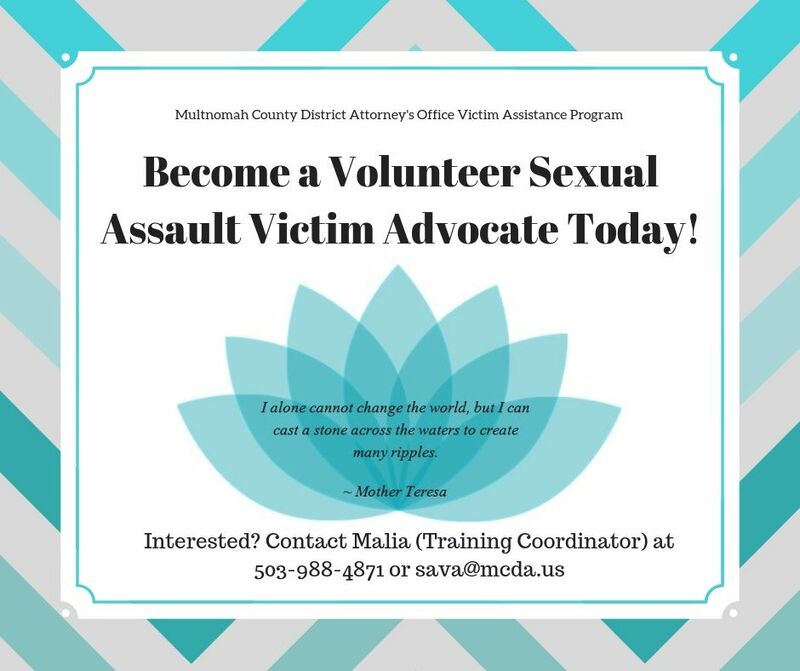 The Victim Assistance Program (VAP) for the Multnomah County District Attorney’s Office is looking for dedicated and compassionate community members to join the volunteer Sexual Assault Victim Advocate (SAVA) team. When a victim/survivor arrives at the hospital to report a sexual assault, will meet with a SAVA as soon as possible. The SAVA will carefully explain the process of potentially meeting with doctors, a Sexual Assault Nurse Examiner (SANE) and law enforcement. The SAVA role during this stage is vitally important as there are many critical decisions that a victim/survivor will make at the hospital. A SAVA can help field many of the questions that arise during a Sexual Assault Forensic Evidence (SAFE) kit examination, and can give victims information early on about what is occurring, and what options they have, so they can process those details in a timeframe that works with trauma. “Nobody should be going through this process alone,” said Christina Baldisseri, who has been a SAVA volunteer for six months. Baldisseri said each response is different Victims and survivors often describe the meaningful value and worth of having a SAVA with them throughout the entire process. “Sometimes my role has been just to be a quiet presence for somebody, which could be holding their hand or just being there so they are not alone while doctors and police come in and out of the room,” Baldisseri said. In all cases, SAVA volunteers ensure the victim/survivor has a voice and is heard. In one of Baldisseri’s cases, she guided a survivor through her options and was able to give the victim/survivor information and support so the individual could make informed decisions for themselves. That early advocacy ensures the victim access to all of the options afforded to them. “We’re looking for people who are very empathetic, compassionate, and want to give back to this community,” Bruni said. 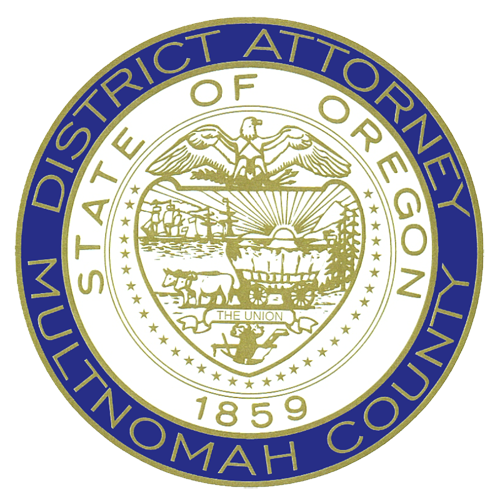 The fall training session will run from October 30 through November 17 and will be held Tuesday and Thursday evenings and all day on Saturdays. 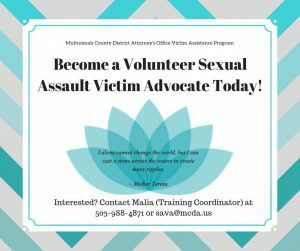 SAVA volunteers will learn the different aspects of sexual assault. Trainees will hear from current MCDA VAP staff, deputy district attorneys, law enforcement and community partners. Sexual assault impacts people across all age, gender, socioeconomic, people with disabilities and cultural groups. That impact can last a lifetime, and is often spread to a victim/survivor’s family, friends and the community. “It really impacts everybody,” Baldisseri said. Selected SAVA volunteers will take on shifts from 5 p.m. to 8 a.m. during the work week and then 12 hour shifts on the weekend. The goal is to have two SAVA volunteers on each shift to ensure there is never a response delay. The SAVA program recognizes and appreciates the value of currently having male, female and non-binary volunteers, which adds to its diverse program and members. 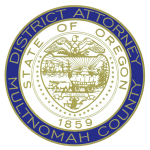 SAVA volunteers will receive support from the Multnomah County District Attorney’s Office SAVA team and its community partners to include case debriefings and updates on legislative efforts. Between August and September 2018, SAVA volunteers responded to more than 40 call outs and spent more than 105 hours with victims/survivors. “I never know what to expect when I’m called out to the hospital but I do know that just my presence being there has a positive impact,” Baldisseri said. The application deadline for the fall SAVA volunteer program training is October 19, 2018.